Mark Webber and Sebastian Vettel have been warned that there may be no quick fix to the KERS issues that appear to be the only chink in Red Bull Racing's armour at the moment. Although Vettel has won the first two races of the season, the German and team-mate Webber have battled with ongoing KERS issues - and neither driver had a fully functioning system throughout the whole Malaysian Grand Prix. And with just one week until the next race in China, which is another event where KERS is crucial for lap time, Red Bull technical chief Adrian Newey has admitted that his outfit is still only beginning to get on top of the hybrid system. "The reality is that it is a system in its infancy," said Newey. "We are not a manufacturer team so we are having to develop KERS ourselves, which has not been our area of expertise in the past. "We are also doing it on a limited resource, limited budget and with limited experience, so we are on a rapid learning curve. How long it takes us to get to the top of that learning curve remains to be seen." 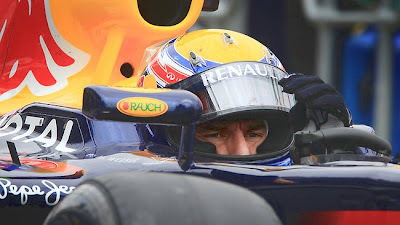 When asked if the problems were such that they could take some time, Newey said: "The fact that we are still finding new problems implies that is the case." Some of the problems that Red Bull Racing has suffered with its KERS have been related to the ultra-aggressive packaging that Newey has demanded for the RB7 – but he has insisted that the team has not been too on the edge with it. "I don't think so," he said. "If the problems we had were all related to the packaging then the answer would be yes, but they are not." Webber did not run KERS at all in the Malaysian GP, after suffering a problem with it prior to the start, while Vettel was told not to use his in the second half of the race. "With Mark we had a problem off the line that meant he could not use it at all, during the race, including the start," said Newey. "He had a problem on the lap to the startline – it was a fresh problem, not a problem we have had before. "With Seb – we had a problem that meant we could have continued to run it, but from a safety point of view we thought it best to turn it off and not take any risks."